You need a network or cable to connect two PCs to use PCmover to migrate data from one computer to another. You can choose to use your wired network (quick), wifi network (slow, not recommended) or this official Laplink High-Speed Ethernet Transfer Cable which enables you to directly connect the two computers. 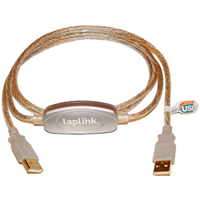 The Laplink High-Speed Transfer Cable is an ethernet crossover cable that connects the 2 PCs directly by plugging into the ethernet port. If you do not want to use your network or do not understand how to connect your PC to your router, via a cable, this is the best option available. It should also give you the quickest transfer speeds. Note that we've discontinued the old Laplink USB 2.0 transfer cable due to incompatibility issues. You can also use your high-speed ethernet cable to keep multiple PCs and Macs up-to-date with the most current files on each computer.